on September 26, 2017, 8 a.m. This month, Shopee is the brand that has achieved the greatest uplift in its Ad Awareness score (whether someone has seen its advert in the past two weeks) in Indonesia. The e-retailer, which only launched in 2015, has taken Southeast Asia by storm through its innovative approach to m-commerce. At the heart of its success has been its problem-solving attitude, pioneering innovations such as its so-called “Shopee Guarantee”, which aims to reassure consumers about the safety and security of online payments. 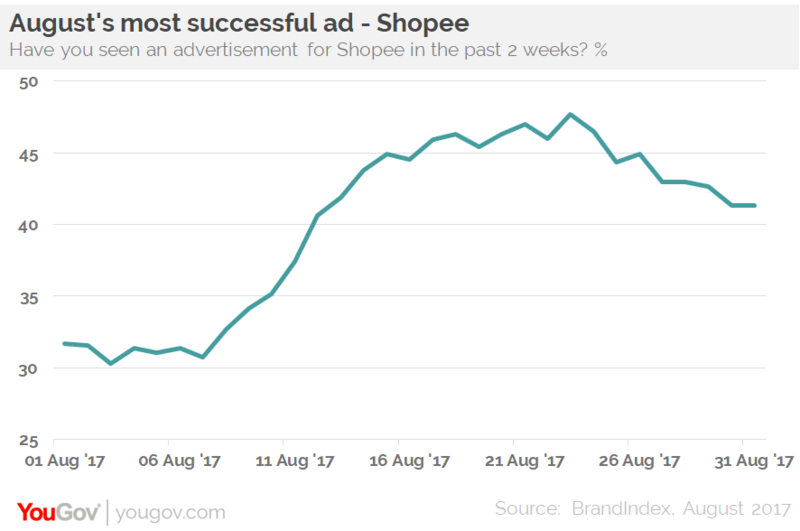 Shopee’s multi-platform approach to advertising, which last month included an expansive billboard promotion across Jakarta and a substantial range of discounts and free delivery deals, was leveraged to great effect in August. Its Ad Awareness score increased by +16 points in the first few weeks of August, from 32 at the start of the month to a peak of 48 on 23 August. It ended the month on a score of 41, +9 ahead of where it was one month earlier. As well as raising the brand’s profile, the campaign appears to have had a significant impact on consumers’ purchasing intentions. Shopee’s Purchase Consideration score jumped from 17 at the start of the month to a high of 30 over the course of the month, tracking the increase in Ad Awareness. Shopee’s marketing efforts appear to have been particularly successful at whetting women’s appetites, with Purchase Consideration scores for women peaking at 43 on 21 August. This is more than double the Purchase Consideration score for men, which was at 19 on the same day. Shopee has since launched its “Brutal September” campaign, which gives Shopee users discounts of up to 90% and free shipping across Indonesia for a wide range of electronic products. With so much to offer consumers in both price and convenience, its dream to become the “Alibaba of Southeast Asia” may yet come true.